Michael Kaiser, along with Monster That Challenged World, brings y'all the 1st eppy-sode o' RadiOblivion for 2010, Clyde! Super Action Blast Sonic Boom edition crammed into a bite-sized, 36 minute aural pummeling kicking off with legendary Punk Rock pounders the Armitage Shanks (named after a British toilet company!) and Wild Billy Childish & the Musicians of the British Empire! Other wild and primitive acts include: the Micragirls (my new favorite band!) from Finland; Atomic Suplex - who will knock yer choppers out with their sheer savage-ness; Georgia swamp-stompers the Shathouse Rats; French-fried Surf by the Taikonauts; killer Instrumental/Surf by One Fathom Down; even more Surf sounds by Get Three Coffins Ready from Colorado (home of one of the greatest Surf bands ever, the Astronauts); the amazing Ragwater Revue; and, of course, everybody's favorite flakes: the Flakes! Most of the tracks played this eppy-sode were taken from Music Alley - the old Podsafe Music Network. Bands, If'n I were you I'd upload yer songs there! 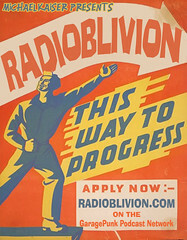 RadiOblivion can now be heard every Wednesday on the 10's EST on Real Punk Radio. Leave a comment below, or use that Google "Call Me" widgey-do-hickey in the sidebar to call in and leave a comment that we can play on an upcoming show. Until next time: Blow Yer Radio Up, Baby!